It was Red Rose Daddy's birthday today and we invited family and friends round for the evening. It was a lovely evening but was somewhat overshadowed by the collapse of Fabrice Muamba playing for Bolton against Tottenham. We are (mostly) Bolton fans so we were all very shaken and upset by what happened. 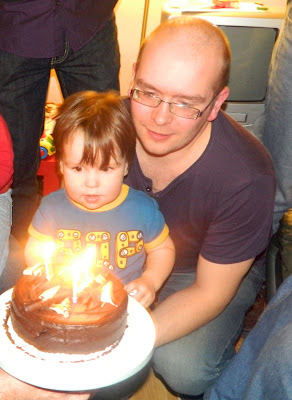 Bud helped his Daddy to blow out his candles, can you spot his haircut?